400°C, 500°C or 600°C Operating temperatures. 30, 60 & 120 Liter capacities. 301 PID controller with ramp to set point function. Heavy duty convection fan for good uniformity. Low thermal mass insulation for energy efficiency & rapid heating. Corrosion resistant, polished stainless steel interior. Suitable for continuous operation (see options*). Double skin construction for cool safe outer case. Hard wearing, zinc coated & stoved epoxy polyester coated exterior. 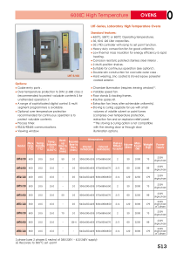 Over temperature protection to DIN 12-880 class 2 (recommended to protect valuable contents & for unattended operation )*. A range of sophisticated digital control & multi segment programmers is available. 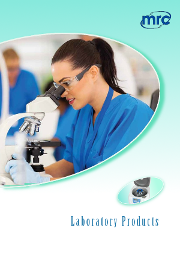 Optional over temperature protection recommended for continuous operation & to protect valuable contents. Chamber illumination (requires viewing window)**. Floor stands & stacking frames. Extraction fan (may alter achievable uniformity). 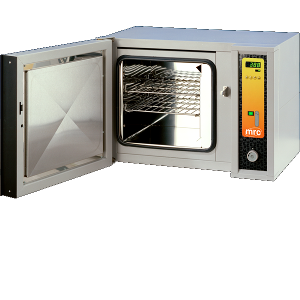 Stoving & curing upgrade for use with small volumes of volatile solvent or paint fumes (comprises over temperature protection, extraction fan and an explosion relief panel. **The stoving & curing option is not compatible with the viewing door or through door illumination options.